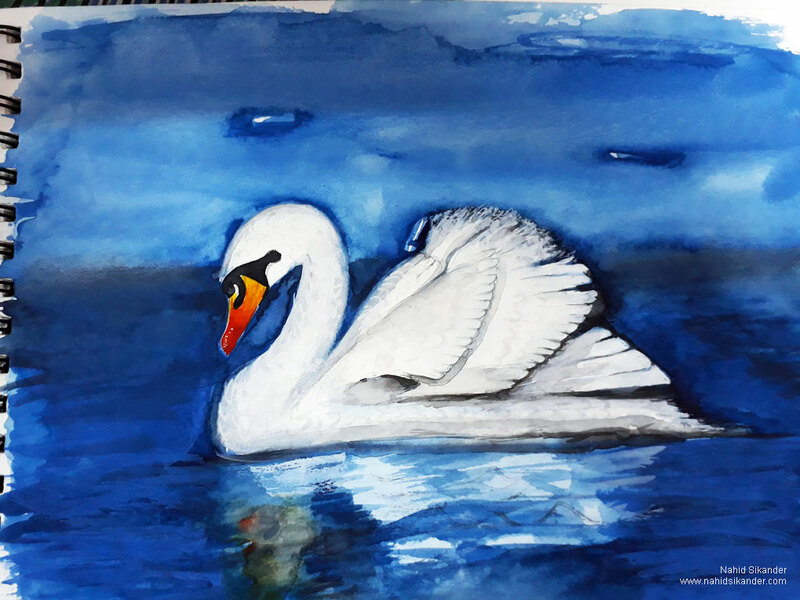 I have painted this amazing beauty by water colours on paper, this painting of swan bird has so many emotions in it. Save wildlife, by saving these birds we should preserve the natural beauty blessed by god. These beautiful swans are becoming victim of hunting and killing. 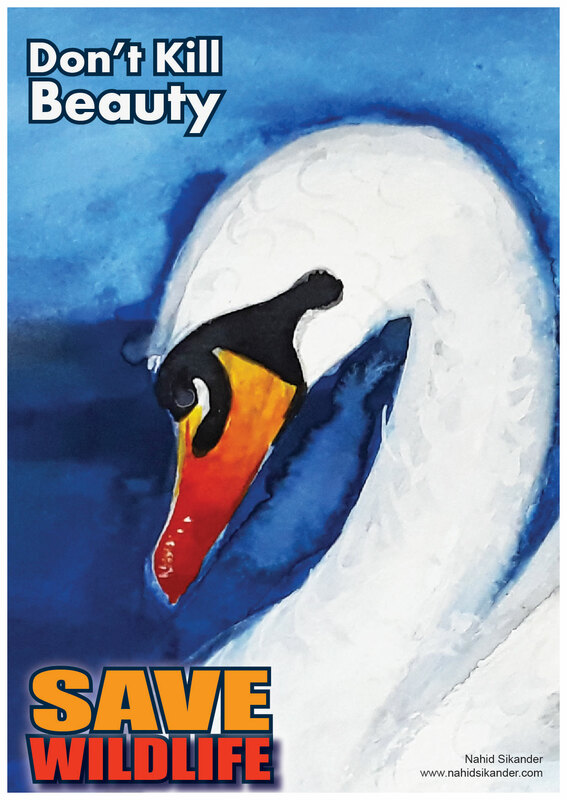 So my appeal is to people that don’t kill these beautiful birds like swan and other wildlife animals. The swan has beautiful white feathers, swimming calmly in the dark blue water, and making the whole environment beautiful. The reflection of swan in the water is also making its appearance on the shining surface of lake. Long rounded, curvy neck is looking beautiful, and the dark orange beak towards the ground (water) is showing its elegant look. Looking down is depicting her down to earth however she is beautiful enough. It is looking like swan is making appearance on the ramp with catwalk on the fashion show with beautiful white feathery dress. And supposing to saying that how can you kill us, although we are beautiful enough to make you feel good while you would be walking in the nature. 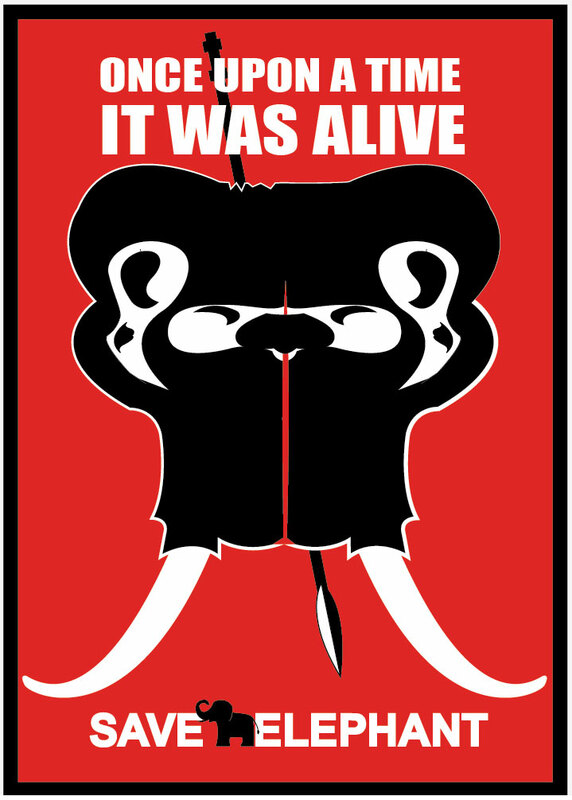 The poster showing the skull of elephant which was alive before, so by this poster I tried to show the grief of elephants and want to educate people by spreading awareness through this poster that Elephants are the important part of our life and environment, so don’t kill them but save them. Elephant does not need an introduction but need attention. It has been killed since long, and there are several reason behind killing them. It is the fact that we are building our space on their way or on their land, thus results the forest are becoming squeezing and human interfere in jungles has been increasing. Some time people kill elephants for safety purpose, to save their crops, to save their houses and as well as human life, but sometime they are killed to become a beautiful decorative items. Elephant bone and tusk (ivory) has been used in making handicrafts, jewellery, decorative, and other ornaments, which are in high demand in the grey market. Almost all over the world the trade of items made by elephant’s body part has been banned. In some areas people used to eat their flash for medicinal purpose. Elephant population has been continuously decreasing due to their regular illegal killing, and they need immediate attention to save their presence on earth. 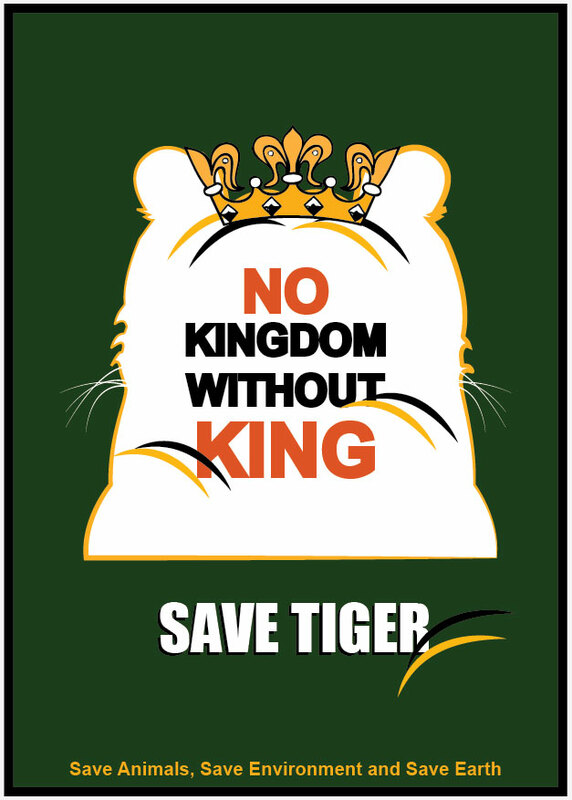 To save our forest kingdom we have to save animals and specially Tiger the king of that kingdom. Stop killing tigers and other animals and save our environment and earth. 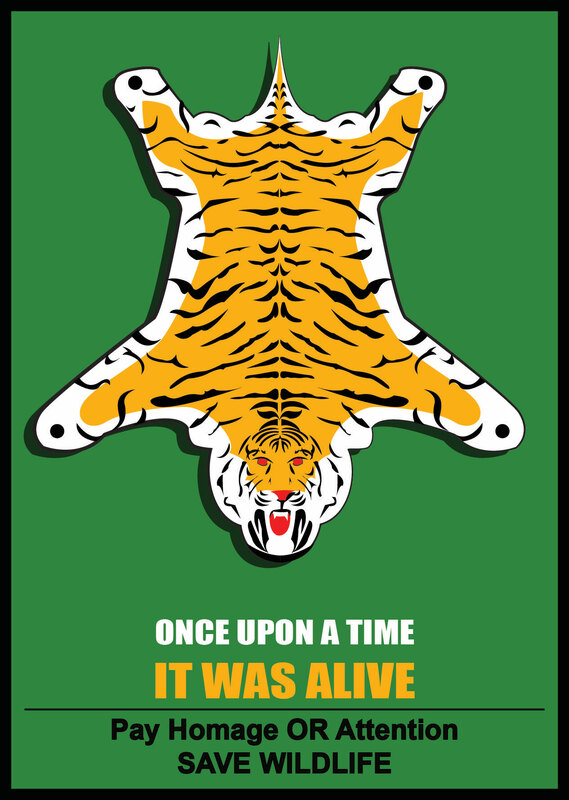 Tiger has been killed and poaching for a long time, so now it is time to take action to spread or to educate people for not killing tiger but save them. There are several other options available for dressing, ornaments, jewellery, and other decorative items so why not use those alternative instead of killing tigers and other animals. 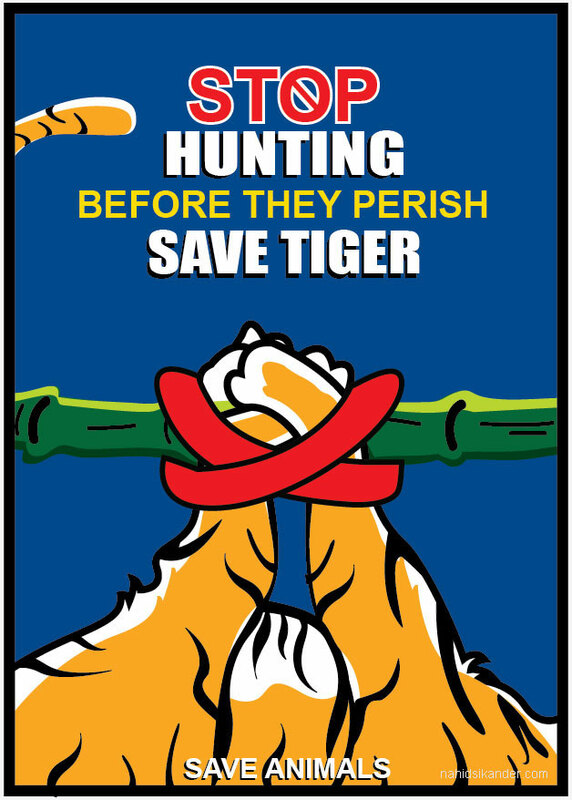 Poster save animals is asking people to stop hunting before they perish. The People realising now that what the loss we have done for our environment, by killing animals and plants. So people started awareness programme to save animals, oceans, rivers, lake and plants to benefit earth. 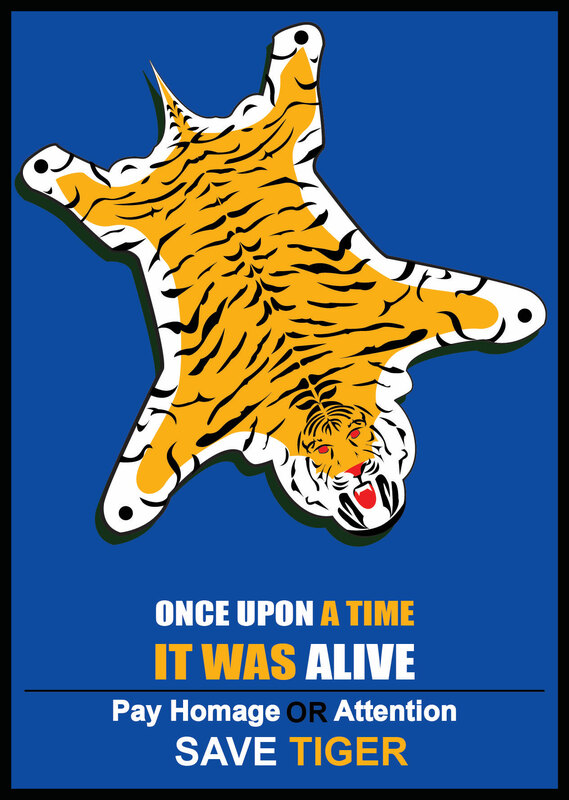 If we dig the history of animal killing tiger comes at first place and its hunt was horrible, because in the past the tigers were like enemy of humans and the tiger hunt is like the certificate of bravery, Raja Maharajas, king and queens were hunting for their enjoyment and symbolized strength. Even now a days tigers in India have been killing and poaching illegally, due to highly paid products made of tiger’s skin and bone also other parts have been used in making Chinese medicine. So animals have been continuously killed by man for any purpose or without. This arising a big environment dis balance threat world wide. So avoid this situation we should make people aware about the loss of earth. Due to increasing human population the forests (jungle) have been squeezing fast and human colonies are taking space on animal home. So all the natural life and their habitats have been effected by these human activities. Because of this unplanned extensions of human life and their creations. We have to think seriously about the animals and other natural assets to preserve them to save earth. Tigers and other animals are assets to nature and we should preserve them. Stop killing animal poster is a part of campaign making people aware of save animal but not kill them, they are the part of out healthy earth. 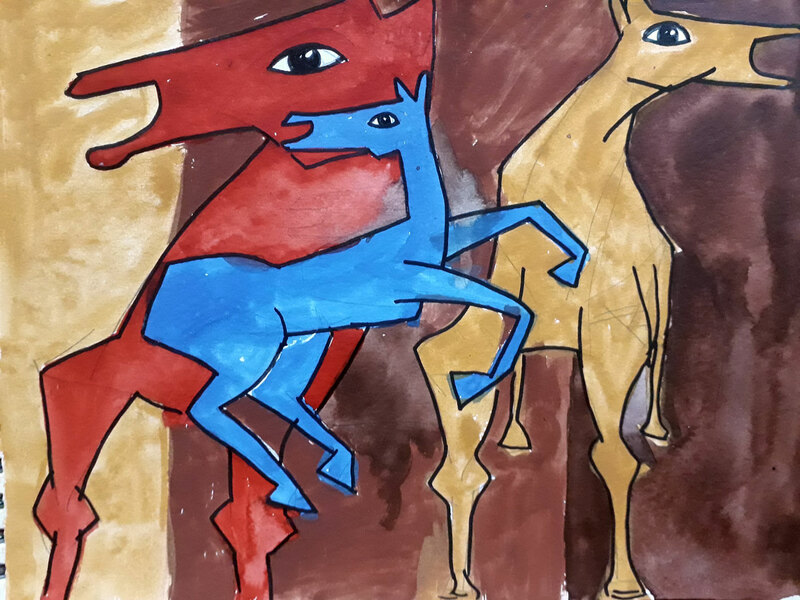 Blue Horse – Poster colours on paper, inspired by MF Hussain Painting. 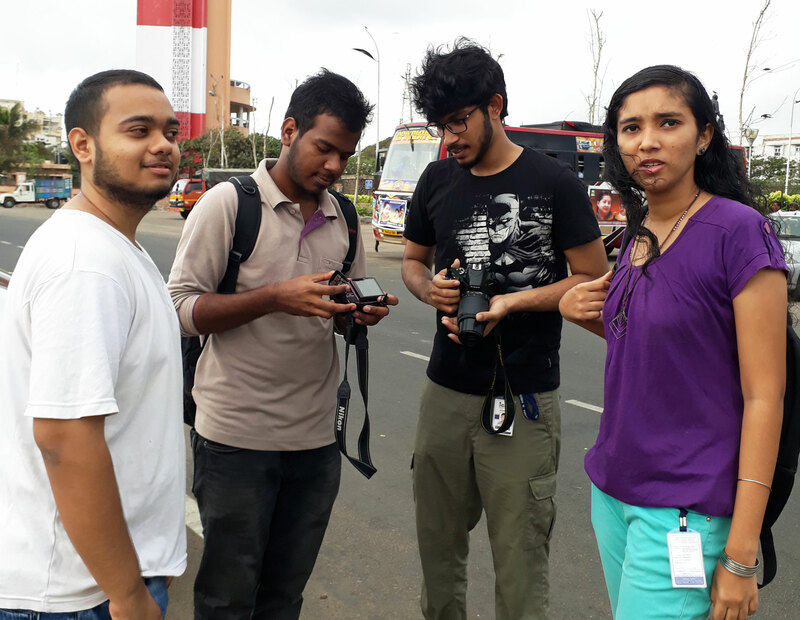 Prithiv, Amla, Siddharth and Sanket, students at icat college of media and design. 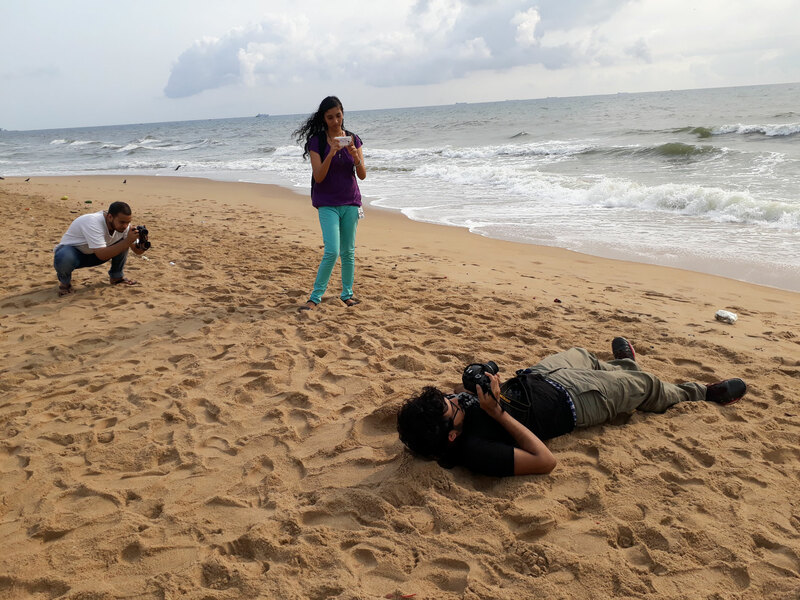 All students went to marina beach to shoot photograph, it was a college assignment for L-4 first year students of advertising division. Students were shooting photographs for their DIIP module of II Semester in which they have to produce an advertise and info graphics by using the illustrations and photographs, and also produce output based on image manipulation. They have to use photographs shot by them-self for photo manipulation. All the students are working differently according to their subject. People are destroying jungles and animal, all wildlife is in danger. By saving animals like tiger we can say in future to our next generation that this is a tiger. But by increasing demand in grey market the tigers are under threat. There are some other option we can use to decorate our house like artificial floor mat, or man made items. When there are hundreds of options available then why we need to kill animals. So stop hunting and live them their natural life. Be them the live beauty of jungle instead of decoration deadly at home. Save Tiger save wildlife and save our environment. 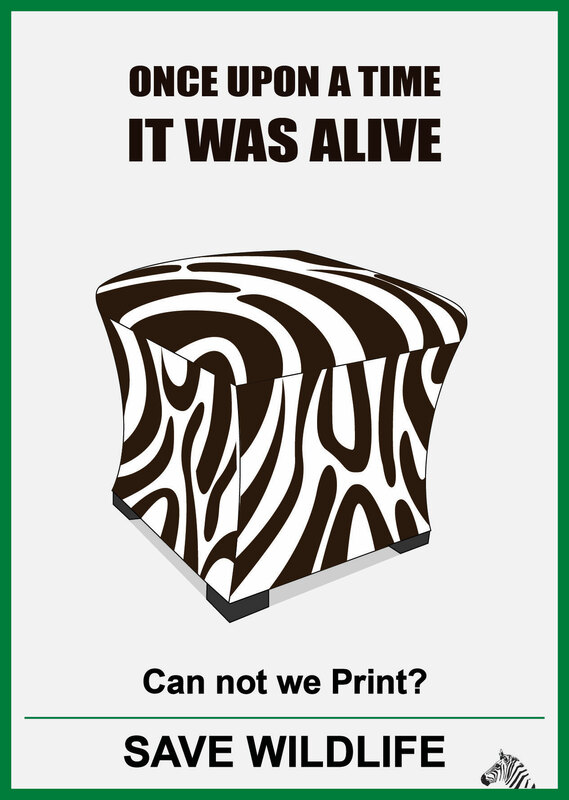 Save wildlife poster developed to protect wildlife animals, it is showing the products made of zebra hide or zebra skin and people are using without hesitation. So Think about when we can use some other material for developing different products with the same look and feel so why we are killing animals for that. Think Once and save wildlife. They are the beauty as well as natural assets for us. Products made of animal hide or animals skin, why we cannot use some other material for making these products, think once and save wildlife. There are some other options available in the world for making any products with same look and feel, so why we still need to kill these beautiful animal, they help to protect our environment and life cycle. 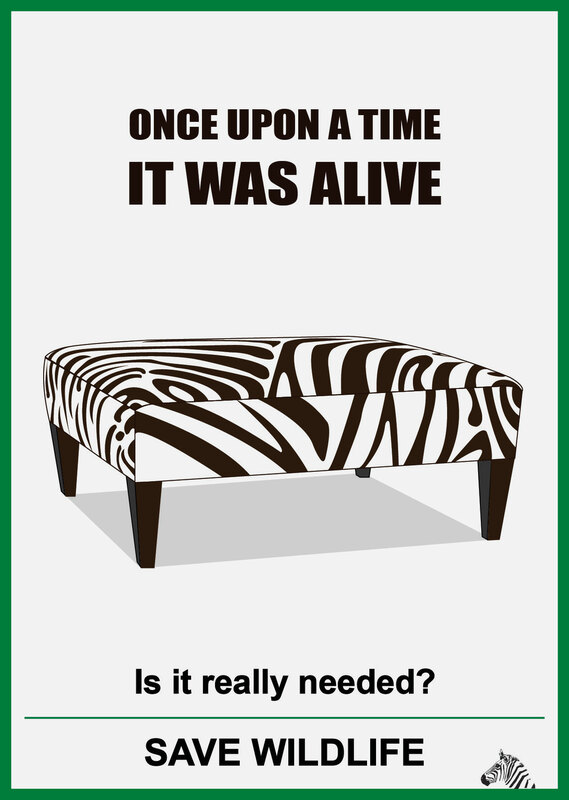 This is poster on save wildlife, image showing the zebra hide, generally people hunt zebra for their hide or skin. I tried to spread awareness about not to use their hide when we can use some other materials for the same texture and design. The illustration of poster developed in Adobe Illustrator and colours used in the poster are dark brown, black and green. So Think once and save wildlife. 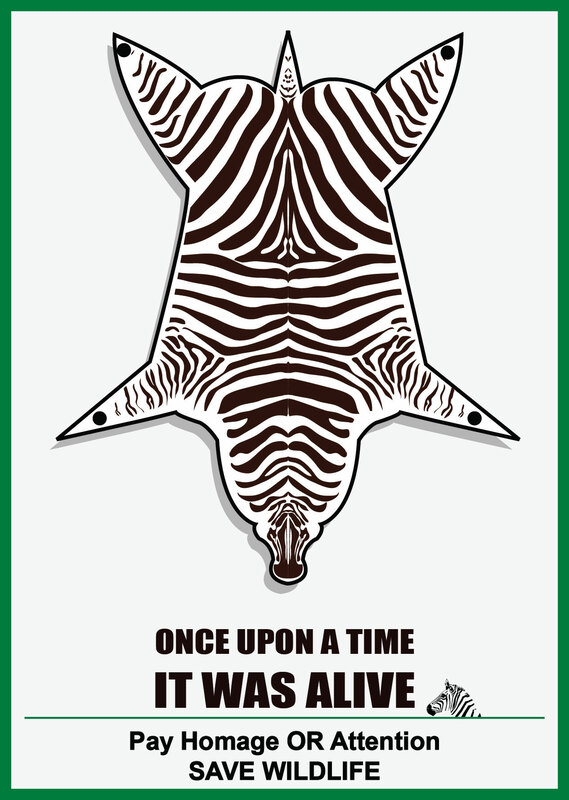 Visual communication is a medium through which we can educate people about save wildlife. 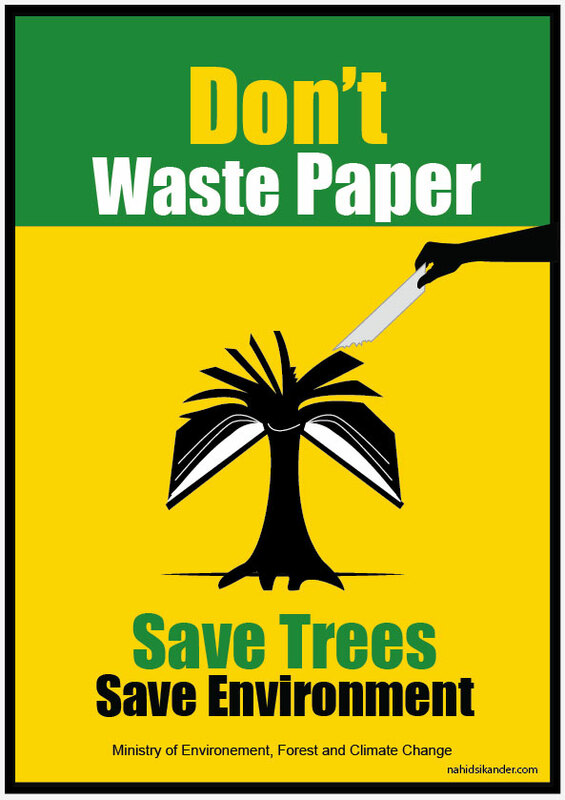 Another version of Poster on save paper for save trees and environment. We make paper from trees and use papers to make different things like books, note books, diary, cards, packaging box, news papers, magazines etc. By increasing population these products are in extra demand and we continuously cutting trees to fulfill the demand of industrialist who make papers. Through this We are destroying our trees and environment, thus effects lots of problem and threats we are facing from climate. This impact very bad to our natural cycle and causing climate problems, like drought, heavy rain, land sliding, less production of oxygen, pollution etc, we are affecting directly and indirectly through these bad impact on environment. It is time to seriously think and work towards save our natural assets, and trees are one of them. So by using less papers we can help our beautiful environment and also encourage less paper use so that we and our coming generation can get fresh environment and beautiful earth. So from today itself STOP Wasting Papers and save trees.